Drop Bear Hostel i Santa Marta, Colombia : Boka nu! A nice hostel, we had a private room and it was more like a flat ☺, a lot of space! This hostel is quite far out from the centre so you will need to get taxis if you're going anywhere else. 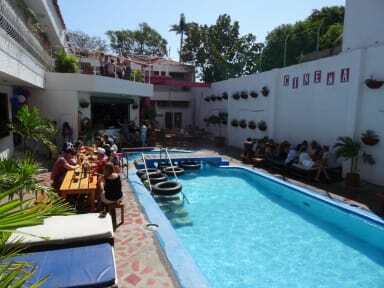 That being said if you want a sociable hostel with a party atmosphere this is the place for you. You can hang out here all day without needing to leave. The food is good and so are the prices. I loved the pool and the massive tv area. There's also loads of hammocks to chill out in. Only negative would be that the guests can get quite cliquey, better for people travelling in groups or pairs. Good breakfast and a place with a lot of potential. But felt like just another party hostel, loud.